The saying "you are what you eat" applies equally to puppies as it does to humans. What you feed your puppy is what grows the bones and tissues of the adult dog. Continued attention to puppy's diet will help ensure a long healthy life. Small puppies cannot easily digest complex, commercial dry foods while their guts are still developing. Indeed, weaning them onto such foods may cause long term health problems and food sensitivities, typical signs of which are: itchy ears, feet or tummies and overly waxy or sore ears. However, your Ronin Boxers puppy has been given the best possible start by being gradually weaned onto wholesome raw foods. If you prefer not to feed raw food, we can introduce your puppy to a premium dry food, Eukanuba Puppy, as it approaches eight weeks when its gut is more developed. Because puppies' teeth are too small to chew enough dry biscuits to meet their minimum daily dietary needs, we first soak the biscuits in water. Initially you should also soak them in water. Then introduce dry biscuits slowly; firstly for part of a single meal; then for all of one meal a day. 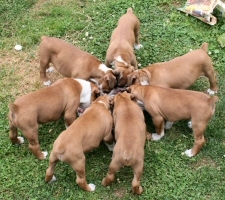 Finally, when puppy is chewing the dry biscuits easily, feed them dry for all meals. When first arriving home, your puppy may not be eager to eat because of distractions in the new environment or lack of competition from litter mates. So find a place to feed puppy that is free of distractions, such as puppy's crate if you have one. If after ten minutes puppy hasn't started eating or is no longer eating, take away the food. Continuous free access to food will either make your puppy fussy or inclined to gorge. Puppies need four meals a day until twelve weeks of age. Then feed three times a day until six months old and then twice daily. If you would like to feed your puppy on a natural, raw diet, we can give you further advice. We can even prepare a "raw raised" puppy for you. The key to a raw diet is providing variety. There is more work involved but, if you prepare a raw diet correctly, your puppy will thrive on it. Get in touch if you would like to find out more. 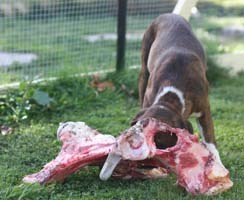 Chewing raw bones, such as briskets, provides wonderful natural exercise and stimulation for puppies. Raw chicken necks and carcasses are a great treat. Feeding raw chicken wings is a little-known secret for correcting bad breath in dogs! Never feed cooked bones which can splinter, hurt your puppy, and land you with a vet bill! This fun and slightly irreverent book shows you how feeding your dog a raw diet can be effective, economical, and easy for you and healthy for your dog. Learn why and how to feed your dog this new (but really OLD) diet. "Raw Dog Food: Make It Easy for You and Your Dog " explains in simple, friendly and understandable terms the logic behind this approach. (BARF feeding) Buy at Amazon.com. This is the best book I have read on the subject of canine diets. It covers raw diets, cooked diets and diets for dogs with food intolerance or allergy. It provides evidence and explanations about some more complicated areas of nutrition, including my favourite part of the book, the development of food intolerances. There are diets formulated to meet AAFCO requirements, unlike many other home-prepared diet books which are more vague on nutrient content and proportions. It describes specific diets that are complete and balanced with a focus on quality and wholesomeness. Buy at Amazon.com. Don't feed from combined food and water dishes. Unless your dog has superb the table manners, some of the food will fall in the water, creating a haven for bacterial growth. Don't exercise your Boxer immediately after meals. Wait at least one hour after a meal before the nightly or morning walk. Don't feed from plastic dishes. While they may not break easily, plastic dishes can cause allergic skin reactions, harbour bacteria, and hold odours than can cause a finicky dog to reject a meal. Metal or ceramic dishes are your best choice. Chocolate is toxic to dogs even in small amounts. Boxers can be especially sensitive. Avoid chocolate! Always provide fresh water. Sometimes, even though a container is half full, the dog is unable to reach the water because of its head size, height or neck length. So check that your puppy can reach the bottom of the container.